This is an about-600 key multi-use Development. The Development consists of a Super - Luxury Hotel of about 180 rooms including Presidential and Vice-Presidential Suites, a Five Star Hotel of about 380 rooms and about 80 Service Apartments. 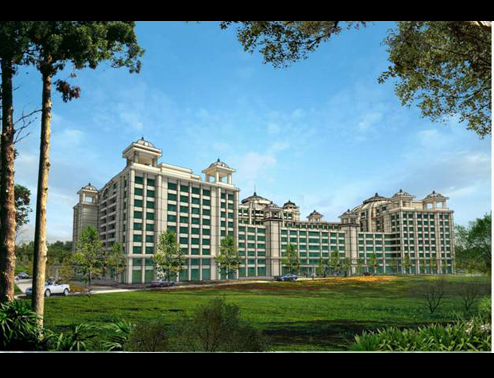 The development also has commensurate Banqueting, Exhibition, Retail and Food and Beverage Facilities. Guest Amenities include a Health Club, terrace level swimming pools and a Spa of about 15,000 sqft. The Elevational treatment and iconography draws on the Chola Architectural language of the Southern part of India. The Design Consultant for the Project is SRSS based in Atlanta, USA and CRN are the Local Architects for this Project, with responsibilities ranging from obtaining Local Authority Approvals to Preparation of Construction Documentation for Architectural Scope of work including façade treatment and glazing.